I’m a big fan of tall tales, urban legends, stories that can be told around a campfire, you know, stories that can immediately grab your audience’s attention and hold it to the end. I think Matthew Weber succeeded in doing just that with his latest collection of tales. 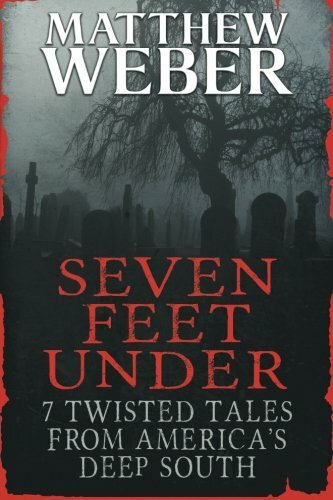 Seven Feet Under: 7 Twisted Tales from America’s Deep South is indeed twisted! Those of you familiar with the South will appreciate the quirky humor that can be found in some of these stories. In Bad Brunch in the Big Easy, we meet Marty a homely guy with a knock-out wife. How Marty got so lucky is beyond him, but boy does he love his wife… that is until that one fateful brunch date at the corner café. He tried, he really did want to help his wife, but hey, even a homely guy like Marty has standards. Daddy’s on the Way is a weird little short tale of a father’s love for his kids and just how far he will go for them. Oh, the irony of it all… Dammit, Mavis is a twisted fun tale of a brother who has spent his life watching out for his younger sister. Mavis has always been thought to be a bit slow, but Earl is about to find out she’s smarter than she looks. Incident at the Buttered Biscuit is both a sad and horrific read. Ronald Burch was a sick man and he paid the price for his sins. Now back in town after ten years gone he’s hoping the town can forgive him. I don’t know about you guys, but I do know southern justice has its own way of righting a wrong. Paul and Ben were just a couple of guys out for some fun. While mudding through the backroads the unexpected happened a girl ran out of woods and ended up under their tires. Scared, the boys thought they could hide what was done, but you know… In the Trees, The Shadows are always watching. No one told Jimmy that the house they just moved into was haunted, soon though he doesn’t need to be told, the ghost is making his presence known. To Kill a Guy Twice is a battle between a young boy and the evil that still resides in his home. If I had to pick a favorite then this is the one, Let ‘em Have It. As any writer knows sometimes it just takes a few deft pen strokes to change the course of a story. Here we find Trip, a young man that has the ability to do just that. So there you have it 7 twisted tales that are all worthy of your time. You can pick up your copy HERE! Sounds very good. Thanks for the review!